The Episcopal Church honors St. Joseph this Saturday, March 19th. If you want to observe this day at home, you’ll need to plan ahead a bit. Contributor Maria Nolletti Ross provides some background on the saint and an idea for your table. I have two patron saints: the one for whom I’m named, St. Mary the Virgin, and my birthday patron, St. Francis of Assisi. Right there in between, married to one and venerated by the other, is St. Joseph. Sidelined and quieted by the gospel writers, enough of his character comes though their words to show a pious man absolutely devoted to his holy family. Lately, as I continue to open myself up to angelic guidance, I’m encouraged by the passages in which God spoke to Joseph through angelic messengers. I’m inspired that Joseph heeded their guidance without question or doubt. But what I really love about Joseph is how well he parented. As Jesus grew, Joseph taught him scripture, Jewish piety, carpentry, farming, shepherding, and even politics. We know this because the parables Jesus told during his three-year ministry are grounded in the realness of everyday life. For example, Joseph was a tekton. Tekton is a common word in ancient Greek which means artisan, carpenter, builder, iron worker, smith, or stone mason. Many believe that Joseph’s area of expertise was carpentry, but he may have been something more like a contractor, knowledgeable in everything needed to create a home. “Everyone then who hears these words of mine and acts on them will be like a wise man who built his house on rock.” – Matthew 7:24. St. Joseph’s connection to fatherhood is why his feast day, March 19, is also Father’s Day in Italy. He is the patron saint and protector of the Catholic Church. 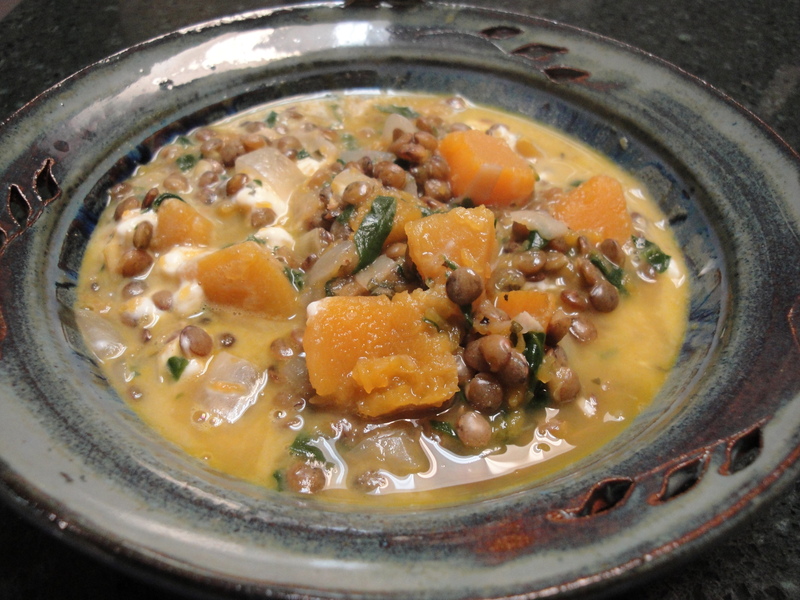 My admiration of St. Joseph and my excitement upon discovering a list of available foods in first-century Galilee led me to create this recipe for lentil stew loaded with gospel-era vegetarian ingredients. It’s a perfect Lenten meal in which to remember the life of St. Joseph and honor him on his feast day. Add onion and leeks. Cook until translucent, about three minutes. Add vegetable broth, garlic, lentils, salt, pepper, cumin, and thyme. Bring to a boil, and then reduce to medium-low. Simmer for 20 minutes. Stir occasionally. Add spinach, parsley, peas and vinegar, if using. Cook on medium for 30 minutes or so until vegetables are tender and most of the liquid has been absorbed. Remove from heat and stir in goat cheese. Serve hot along with homemade pita bread. Wonderful post! I too have a love for St. Joseph. He’s a wonderful saint that is so quiet that he often gets overshadowed by bigger personalities. Happy to see him featured here! and thanks for the recipe! Thank you for the idea to celebrate St Joseph’s feast day with a nice hearty feast! How about a dessert recipe too? Feel free to arrow down past the St. John the Baptist bio and the recipe for honey-spiced locust. See? Convoluted. BUT, many traditional feast day foods are served in honor of more than one saint. So there’s some logic in that. However, I concede that many Italian Americans call ’em St. Joseph’s Zeppole. Depending on the region! Okay. I’ll stop now. 🙂 Enjoy! The author tells me it will get you 4 heaping servings. I quadrupled the recipe for our Maundy Thursday dinner. Thank you for this easy stew, easy once I chopped the onions and leeks through my tears. 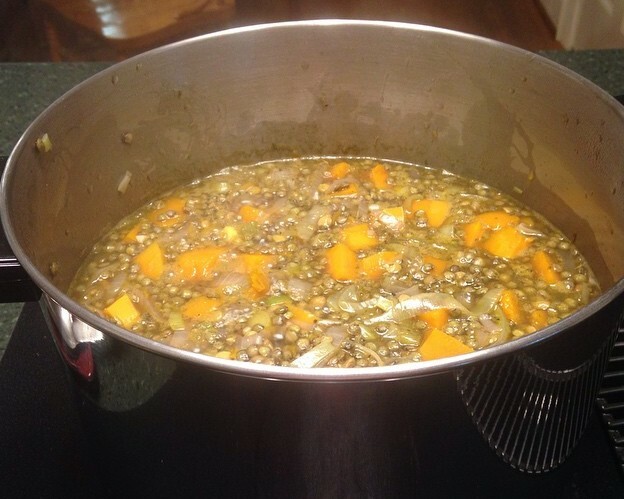 Was the lentil soup posted for both Saints Joseph AND James or were the recipes different? Gracias. They are different recipes from two different authors. Thanks for asking!